Today Owen finished framing one of the long port walls. The long length of the wall posed some new challenges, documented in this video. He also made some modifications to the wall, demonstrating the need to plan for interior details while building the exterior. While the Tumbleweed plans specify a marine boat heater for warmth, we’ve heard a few reports that the boat heater just doesn’t cut it in a New England winter. An alternative we discovered is the Hampton series of propane stoves, one of which is small enough for a tiny house but puts out much more heat than the marine heaters. Because of its larger size and clearance requirements, Owen needed to study the floor plans carefully to find a place the heater could fit. Moving one of the windows freed up the right amount of space, and that required changing the framing of the port wall. 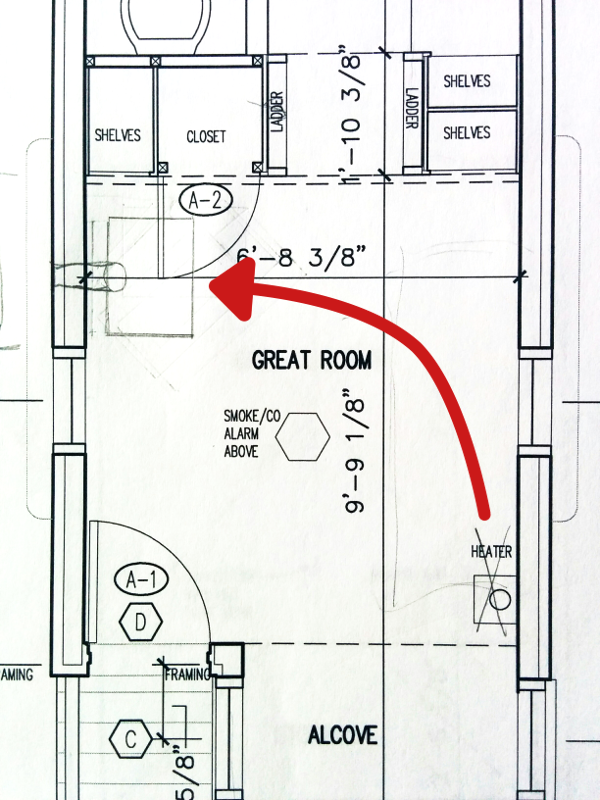 The red arrow shows how we changed the heater from being mounted on one side to a larger heater in the corner. The Youtube video is marked Private so I can't see it. Thanks for letting me know! I changed the setting. Please check out the video!